I apologize for the delay in showing you Christmas pictures. I’m afraid it’s all my fault…I didn’t take many… oops! 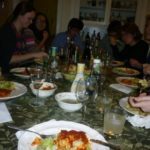 We ended up having a Christmas party the weekend before Christmas and we decided to hold it just a week before. It was crazy! 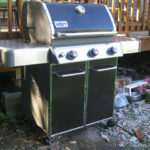 The piano came Monday and I spent the whole week painting, cleaning, and cooking. It was soooo much fun! I put up 2 trees and the brigade of nutcrackers and some garland and in my frenzy to get things done, I didn’t take pictures. 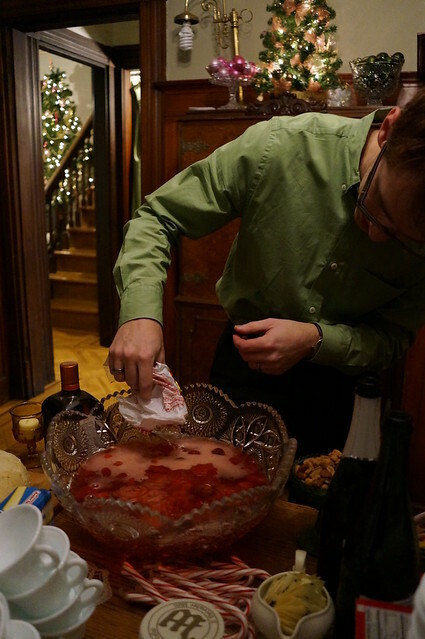 And then, after the party, I took it all down…before Christmas… Sacrilege but I was cleaning up. 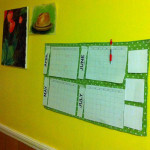 My last year doing that myself instead of calling for the Houston’s Ready Set Maids service, seriously. Luckily one of my bestest friends ever, Pam, came to the party. She lives in Seattle and is a very talented and stylish mechanical engineer but was visiting her family just in time for the event. 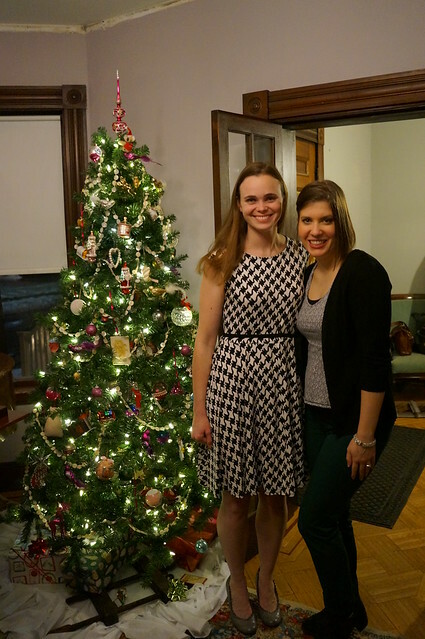 She brought a fancy new camera with her and has generously shared the photos she took at the party and now I can share them with you! 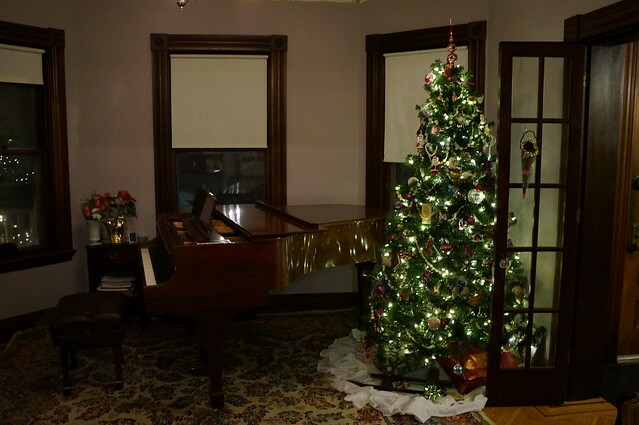 We put the “main” tree in the piano room in the nook of the grand piano. It’s not quite tall enough for the space I don’t think but it looked good. I have my half of the ornaments from my childhood and those made up the bulk of the decorations. I think next year I may do a “fancy” tree in this room and a “real” tree with the childhood ornaments up in the den. Rather it’s actually a real tree or not remains to be seen. We may just wait for the “real” tree for when we have kids to care about these things. My family didn’t do a real tree except when I was very young so I don’t feel the need but Stefan is more of a tree aficionado. The tree is in the entry way setting on a couple plastic bins to make it taller. I draped a 2-yard piece of faux-fur over the bins and it turned out great! The tree has all the Saratoga Springs annual ornaments that Stefan’s mother saved over the years for Stefan’s future wife. Such a cute gesture and the annual ornament is a welcome gift every year. 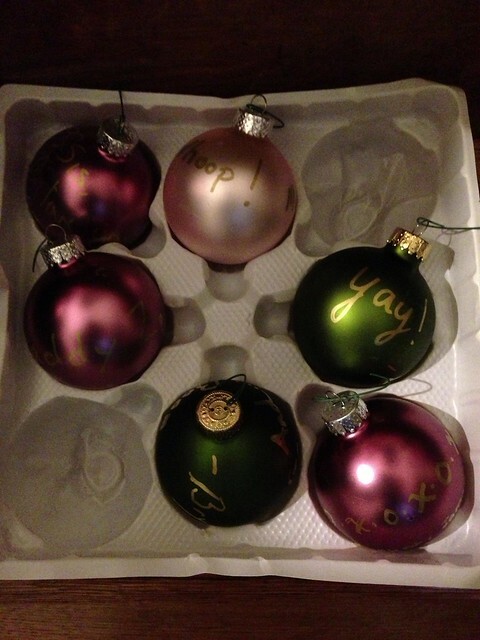 I also took all the larger ornaments that the guests signed at our wedding and hung them on the tree. The topper is again a vintage topper. 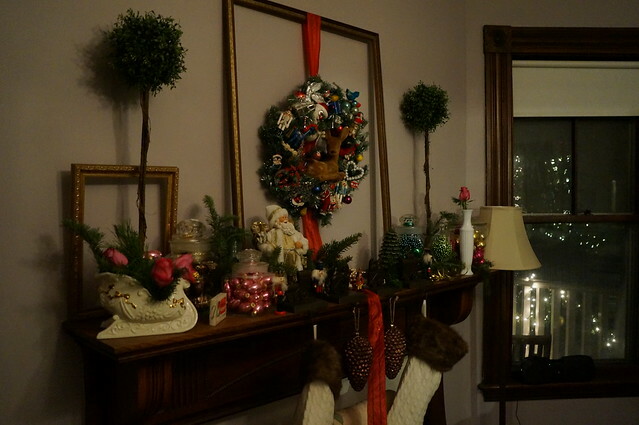 The garland on the tree is a super duper obnoxiously long string of gold beads that I found at an estate sale when I was buying all the gold and pink christmas decorations I could find for the wedding. The $13 tree was a bit round for my taste so I fluffed it into the shape of a pencil tree which fit the space so much better. Since it was a cheap tree, it was easy to do by not bending the branches down all the way. 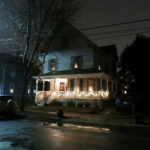 The garland on the banister is the same as the ones outside. The pearl garland I believe is from my mother. She had pearls on the “fancy” Christmas tree when I was growing up but I can’t recall if these are hers or if I picked them up somewhere. 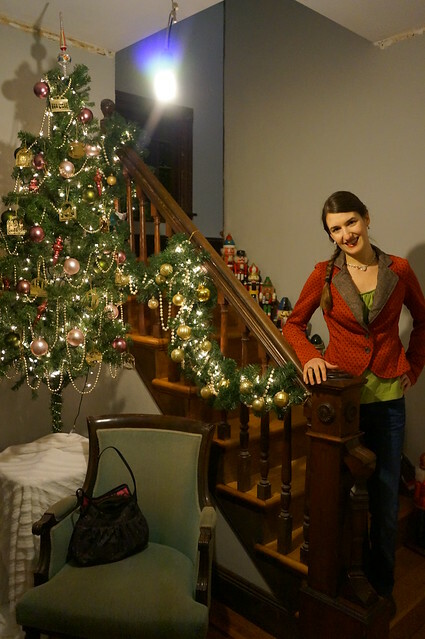 The gold ornaments on the banister garland are from…Dollar tree. They are plastic because Vector is a little bugger and this was his plaything. Luckily, it kept him busy enough that the other trees never even got noticed. Unluckily, the sound of paw on plastic ornament can be heard from our bedroom in the middle of the night! 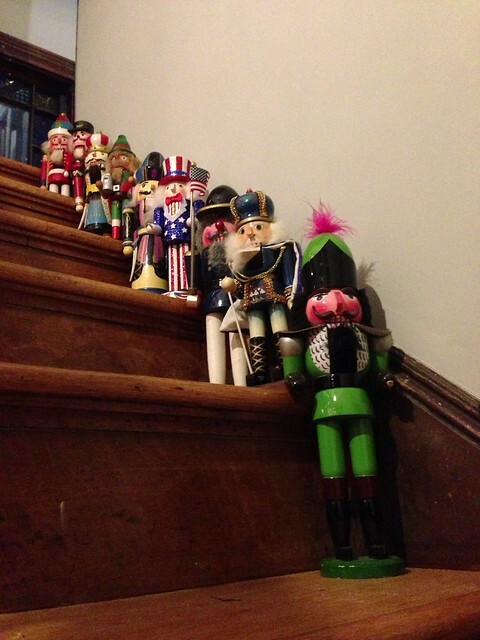 On the stairs was my regiment of nutcrackers. They go on the stairs in ascending order. They have since I was a baby and now that my mother is in a 1-story house, my sister and I split the lot of them and they are on my stairs now. Our stairs are maybe a bit narrow for them but I can’t bear to put them anywhere else. 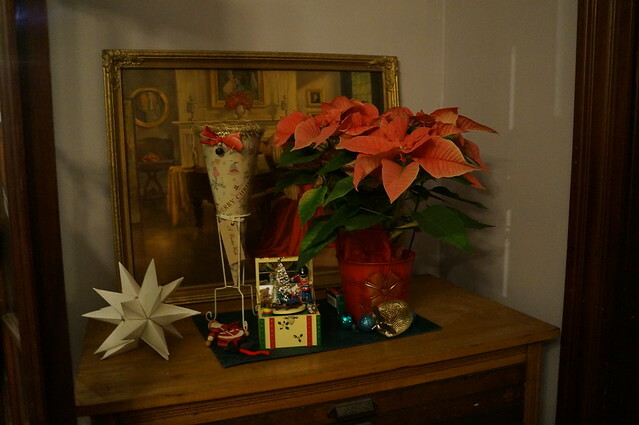 Some of the other details – a poinsettia, a small tree on top of the bar, and the mantle. For 1 week from nothing to decorated and a party, I’m quite pleased with the decorations and I can’t wait to go all-out next year! Thanks again to Pam for the pics!